Jennifer and her team were an absolute dream to work with. I was a very indecisive bride and Jennifer led me in the right direction from engagement photos up until my wedding day! I absolutely trusted her to do whatever she wanted with my make-up and she did not disappoint. I HIGHLY recommend her! 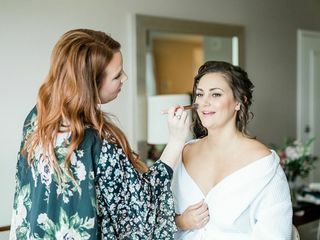 I'm SO glad to have chosen Jennifer to take care of my hair and makeup on my wedding day! I'm very picky about my makeup and I was worried about finding someone who could master the look I had envisioned for myself. Finding a good makeup artist was one of my TOP priorities when it came to wedding vendors. Jennifer quickly put my worries at ease when I met with her and she exceeded my expectations. She made me feel confident and beautiful! She spent hours with me at my trial to make sure everything was exactly as I wanted, then she took notes and replicated the look on my wedding day. She's organized, punctual, fun to work with, and very talented! Plus great communication and easy to get in touch with if I had any questions whatsoever. I highly recommend her! Jennifer is the best! I met her when she did my makeup when I was in my friend's wedding party. It was an easy choice after that and I booked her for my own wedding. She is very knowledgeable and asks plenty of questions to make sure she is achieving the look you desire. For example, I wanted a textured updo with looser pieces framing my face. She advised me to have my hairstylist cut my hair a certain way so that I could pull of this style. She took my super smooth, fine hair and worked her magic. I was also lucky to have her do my makeup for my engagement session. If you are nervous about your look or don't wear a lot of makeup, I would recommend doing this. Outside of the bridal trial, which is included in the cost of your wedding day makeup, it helped me to have a comparison. 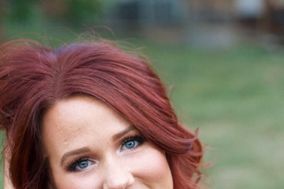 I was able to see my engagement photos and see how the makeup appeared. This helped me decide to go a little more glam/dramatic even though it was not my instinct. On camera, you see less makeup and it's more about highlighting your features. Most importantly, I felt beautiful and I felt like a bride. People were asking for Jennifer's info at the wedding! I will definitely pass her name along. Thanks to Jennifer, I felt like a $1 million buck on my wedding day! 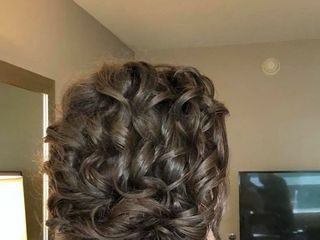 I have naturally curly hair and was really worried about having a bad hair day on my wedding. Jennifer took the entire 4 hours of my bridal trial to try a few different hair styles. She ultimately tried a style that wasn't on any of my Pinterest boards but was exactly was I was looking for! I could tell that she care about the way that I felt on my wedding day as much as I did. I felt so much relief after my bridal trial because I knew that she would stop a nothing to make me few beautiful on my wedding day! And I totally did! All of my bridesmaids LOVED Jennifer and her team. Many of them said that it was their favorite wedding hair and makeup that they had ever had done. Thank you Jennifer and Team for helping to make my wedding day the best day ever! Jennifer was great to work with. Her little studio off her house is so adorable! I was so nervous the first time that I went for a consultation because I'm not someone who does a whole lot of make up. I like to keep it simple. I came with a few idea of things I wanted but let her use her creativity where she saw fit. She made me look amazing! My mother really wanted her hair and make up done as well. I talked with Jennifer about doing a consultation with her in the days before the wedding because my mother was nervous about it. She was accommodating and let us come in for that. On the day of, she was early and she did a fantastic job with both my mother and me. We both looked gorgeous and got tons of compliments. Jennifer is amazing! She did my makeup for our elopement. She actually had another bride + bridal party booked for that same day, but was able to accommodate me by having me come to her studio that morning prior to the time she was needed for the next bride. I am beyond thankful to her for this! She did such an incredible job + made me look naturally flawless. YOU CANNOT GO WRONG CHOOSING JENNIFER! Beyond her awesome beauty skills, she is super professional + soo nice. If you are searching for someone to do your hair/makeup, the search ends with Jennifer because it seriously doesn’t get better than this! Jennifer is seriously a miracle worker, she is insanely talented. She is easy to work with, responsive, and down to Earth. Seriously, she can make all your Pinterest dreams come true. If you enjoy working with vendors that are quick and to-the point and don't send you pages of rules and stipulations like me, then you will love working with her. Jennifer is truly a joy to work with, not only for her friendly personality but for her talent. I am very indecisive and she was able to create every single look I asked her for. Book her early! I booked her almost a year in advance (thank goodness!) and am so glad I did. Her work speaks for itself, I highly recommend booking Jennifer Abercrombie for your wedding/event needs! Jennifer did a great job with my hair and makeup for my wedding! She is very talented and I highly recommend her! During the consultation and on the day of my wedding she made me feel very comfortable and relaxed. Like a good girlfriend was doing my makeup and we were just hanging out but with amazing, gorgeous results. Jennifer Abercrombie is second to none! I booked her just a few months before my wedding and she was incredible at responding quickly... even late at night! It was really hard for me to find someone I trusted to listen to what I wanted but she delivered! I've had makeup artists ignore my wishes for a fresh and clean makeup in order to make me look good for their portfolio but Jennifer really just wants to see you happy with YOU'RE look! I even changed what look I was going for a week before the wedding and she gave me exactly what I wanted without even needing to do a second trial! She's incredibly sweet and funny and can bring any ideas you have to life! If you follow her on Instagram it's very clear that she puts her heart and soul into what she does! It's not just a hobby... it's truly her passion and you will be in the best hands possible with her! I could go on and on but there aren't words to describe how beautiful she made me feel on my big day! Jennifer is amazing!!! All of my girls look so wonderful and I was soooo pleased with my hair and make up. She is super prompt and we were perfectly on schedule and even finished early the wedding day. We received so many compliments from family and friends that attended my wedding. I would highly recommend her to anyone, she is wonderful!!!! Jennifer was an absolute sweetheart! We didn't do a trial run for my bridal look and yet she made me feel so comfortable the day of and confident that I was going to be the most beautiful bride. She beat me to the venue and was ready to start when I got there. She asked a few questions and was ready go! We laughed and joked.. which didn't slow her down a bit! & once I saw the finished product... I have never felt so beautiful in my life!! Seriously, wish I had her to do my makeup everyday! If you want the best, she's your girl! Jennifer is by far the best at what she does. She listens & accommodates the desires of her clients, all with a pleasant & positive attitude. Her professionalism & prompt communication is hard to find elsewhere, she truly will treat you like a priority. Her product, much like her service, is nothing short of phenomenal. I had 14 bridesmaids in my bridal party & without hesitation she gathered a group of local hair/make-up artists to work alongside her on that day. Not only is she the best at her craft, but she genuinely is the best for the job! Abby! Thank you so much for the kind words! It was truly such a joy for me to be a part of your wedding day!! You are such a blessing to everyone, including me, and I am so thankful that I was able to have the honor of doing your hair & makeup! I contacted Jennifer about three weeks before my wedding asking her if she would be available to do my makeup, I saw her Instagram page and loved how she did makeup! Thankfully she was available! When we did my trial I left completely in love with my makeup and didn't want to take it off. She was the sweetest and always made sure I liked how it was looking. We were also able to have conversations and get to know each other, she is very friendly and kind! A day before the wedding my bridesmaids wanted me to ask if she could do their hair and even though I asked her last minute she had no problem arriving earlier than what we had said. She was absolutely wonderful! She's very professional and does such a beautiful job! I would book her again and again if I could! Jennifer and her team were absolutely wonderful! Jennifer was quick to respond and allowed me to change my mind several times without getting frustrated :) She was wonderful to work with and was able to take my vision out of my head and make it a reality! When it came down to our wedding day, of course I was running late-what bride doesn't run late. She made sure I looked flawless and my hair and makeup were exactly what I wanted before I left. Jennifer and her team were a blast the morning getting ready- they even sang and danced with us! I highly recommend Jennifer. She is truly an artist and so wonderful to work with! Thank you Jennifer! I was feeling so discouraged by my search for a hair and makeup artist until I found Jennifer! She has such a fun personality and really understood my vision. I was able to relax and let her do her thing while she and her assistant made all of us ladies look gorgeous. Her prices are a steal for the quality you get. What are you waiting for? Book her! I can't thank Jennifer enough for helping make my dream wedding a reality! She is amazing at what she does! Jennifer was so patient and accommodating from the trial up until the day of. I don’t think I’ve ever felt more beautiful than on my wedding day. :) I received so many compliments on my hair/make up and my inbox was full of requests for her contact information! I even had one of my bridesmaids say she felt prettier on my wedding day than on her own wedding day— that’s how you know you’re awesome at what you do! :) I will definitely recommend Jennifer to anyone that will listen and will absolutely be booking her for any future hair/make up needs. So happy I booked Jennifer for my wedding for hair and makeup..she was highly recommended by our photographers and I understand why. Not only is she amazing at what she does but she is also super sweet and so much fun. Her and Erin did a awesome job and all my bridesmaids looked wonderful. I have never felt more beautiful than on my wedding day and that is how every bride should feel. I highly recommend her to any bride for their wedding day or to anyone who needs their hair and makeup done for any event!!! 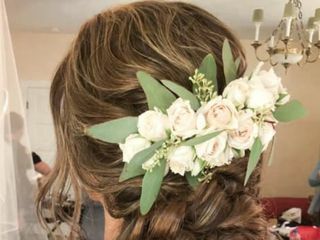 Though I had a "budget wedding," I knew that I most definitely didn't want to skimp on my hair and makeup. I did a lot of the wedding decor, details, invitations, and dress altering myself, but I wanted to make sure I didn't have to stress about what I looked like! BEST DECISION EVER. Jennifer was fantastic to work with, and I loved her work on the wedding day [and the trial day]! I trusted her completely, and I was very happy - especially looking back at the photos now! I highly recommend Jennifer to everyone!